Could probiotics help a colicky baby? When new parents conjure up images of their first few weeks with their new baby, they often picture a peacefully sleeping baby, followed by hours of playing and cuddling with their wakeful baby. However, in actuality, most parents of newborns endure hours of an inconsolably crying and extremely fussy baby. Infantile colic describes an excessively crying and/or fussy/gassy baby that is unrelated to a medical problem and it affects approximately 1 in 4 babies under the age of 6 months. A colicky baby either cries or is fussy for hours, usually in the evening, and nothing really works to soothe the bouts of crying and/or fussiness. Unfortunately, the specific cause of infantile colic remains a mystery; however, there are current prevailing theories that include cow’s milk protein allergy from the mother’s diet, immature digestive tract causing difficulties with digestion, or inadequate maternal-infant bonding. Importantly, none of the attempts to find an effective remedy for infantile colic have proven helpful. The good news is that infants outgrow these complaints within several months. Over the years, several pharmaceutical and non drug approaches have been tried. To date, none of these have been shown to be a great success, although in some trials they were successful. Simethicone, a surface active compound, has shown possible benefits on colic symptoms over placebo (sham drug) in some trials, but not in others. The medication dicyclomine, which decreases spasm (contractions) of the gut, seemed to help in several trials. However, when compared to placebo, there were some cases of drowsiness, constipation and diarrhea. There have been case reports of more severe, but rare side effects, including apnea (stopping breathing), seizures and loss of consciousness. Recently, doctors are using more antireflux drugs. You may want to discuss these various options with your baby’s doctor. A lot of doctors suggest dietary interventions, the most common being the avoidance of cow’s milk. However, here too the results were not clearly beneficial. 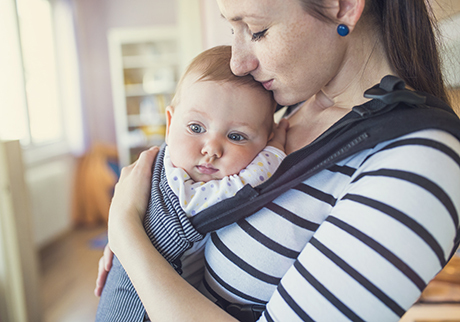 Recently, doctors in Italy have suggested that probiotics may prevent infantile colic or soothe its symptoms, as evidence suggests that an imbalance in an infant’s gut bacteria may be the culprit. The theory goes like this: Having a healthy balance of good bacteria in the gut is essential to maintaining good health. Newborns are born free of any bacteria; as they pass along the birth canal, they gather up a mixture of bacteria from mom. However, often times, the infant gut may not pick up enough of the “good” bacteria, lactobacilli, and instead, gather up too much “bad” bacteria, such as E. coli, consequently, leading to infantile colic. Therefore, giving babies probiotics may help build the “right balance” of friendly bacteria in their gut, which may help build their immune system and improve digestion. The Italian study suggested that giving infants probiotics containing Lactobacillus reuteri not only prevented the onset of colic, but also shortened a colicky baby’s crying and fussy/gassy episodes. Probiotics also prevented infant constipation and regurgitation. Although there is evidence of the effectiveness of probiotics to help prevent and improve infantile colic, the study was conducted in Europe and needs to be repeated before millions of infants receive treatment with probiotics. Therefore, Health Canada & The Hospital for Sick Children initiated a Canadian study to investigate the use of probiotics to treat colic in Canadian infants. The study is still recruiting colicky babies to participate in the Probiotics for Colic Study. If you have a crying, fussy/gassy baby, your baby may be eligible to participate. For more information about the Health Canada & SickKids Hospital’s Probiotics for Colic Clinical Study, please contact Kim Chau or call 416-813-7283. You may be told that probiotics may help babies’ colics, but at the present time the jury is still out as we await additional results.